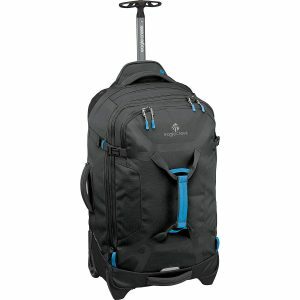 Eagle Creek Load Warrior is a 26 inch size soft shell luggage with a contemporary design. It is offered in black, concord, smoky blue and tan/olive colors with the slightly different design of the first two and the last two. Otherwise the measurements and all the other features appear to be the same. The rating for this model is 4.4 out of 5 stars by 29 customers, indicating a decent amount of satisfaction. It offers a great amount of abrasion resistance with the eco-skeleton making the wear points stronger. You’ll find hypalon material on the corners to avoid fraying and the ballistic and ripstop materials making it even stronger and water repellent. There is a section on the top of the bag for items that you wish to access easily. And inside you have the main compartment with the elastic compression straps to keep your clothes in place and a large zipped pocket that you can put your dirty clothes or whatever you wish to separate from the main compartment. The large treaded wheels have the metal protective housing and move smoothly on different grounds. It has the lockable zippers that you can pull with your fingers easily and the reflective bits make sure the bag can be seen easily in the dark. The Eagle Creek Load Warrior weighs 5 lbs 6 oz, has a 63 liter capacity and measures 15.5 x 26.5 x 11 inches. It is very lightweight, yet sturdy and durable and can hold quite a lot. It also expands out an extra inch if you need more space. Even small kids can carry or move it easily. You can use the Unique Equipment Keeper to attach your gear to the top and to open bottles. 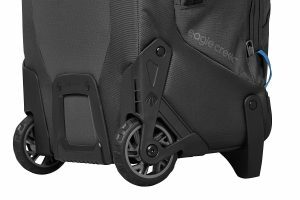 With the exterior compression straps and several haul handles your gear will be safer and you can simply grab the Eagle Creek bag and leave. The wheels are quite solid with the metal housing and you can expect them to stay solid and strong for a long time if not treated very rough. You probably want to check it in before your flight or ask the counter if you can take it on board as a carry-on bag. But it should be OK as a carry-on bag on train trips. 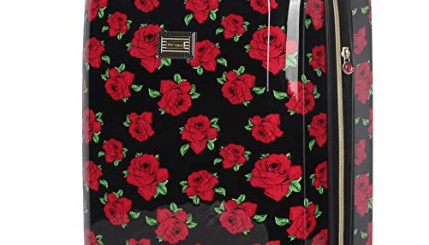 We do not know for sure if this 26” bag will fit in all overhead bins on planes but it will in most, that is if you manage to take it to the plane. There is an Osprey compression sack for undies, socks or other stuff that doesn’t need to look neat and pressed. It is best that you don’t put any fragile items in this soft-sided bag. It is quite a good size for a longer trip and feels stable when fully loaded and it will not topple over. The materials stay as new without any signs of wear and tear but the color can pick up dirt. You may want to perhaps choose a darker color, but you can easily clean it with a damp cloth and it will still be easier to find the lighter color bag on the airport carousel. It has the premium materials inside and out, is spacious inside and offers plenty of space: Overall great value for money.